PROBABLY the most unusual thing about Renault's Dauphine is that it seems so big even though in reality it is very small indeed. I don't.mean only in physical proportions. If a car is shortish and low and quite narrow there's a limit to the ways you can disguise it, but it's in road performance that the Dauphine is such a giant. Once again I'm in trouble. You probably thinkk I'm trying to say that this tiny Frenchman goes like a rocket, in which case you'll glance at the panel over the page and call me a liar. It doesn't go like a rocket. But all the time it feels as if it is. That's the important part. The Renault Dauphine is the only car of its class to have four doors, all of which are rather small, but not impossibly so. 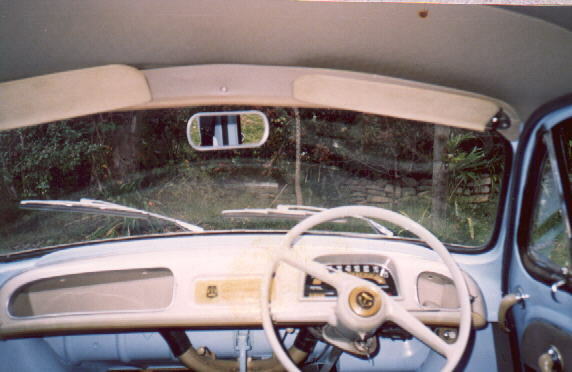 This is the interior of our 1958 model, which is the same as the 1960 model. Click on the picture for the enlargement. The rear-mounted 845 cc four.cylinder engine goes about its business with surprising zest and very little fuss. In fact it gives the impression of being both bigger and more powerful than any of its small family.class rivals, whereas in fact it is neither. Undoubtedly much of this silence results fiom the engine's remote mounting right at the tail of the car. Another contributing factor is its “old-fashioned” cooling system which does away with the need for a noisy, high velocity fan. Low gearing is largely responsible for the unit's powerful feel. Critics often moan that a low.geared car is a nuisance because it has a feeble top speed. Renault have overcome the objection as far as they can by giving the Dauphine a smooth, low drag body that excuses the engine from as much work as possible. Meanwhile the car reaps the advantages that low gearing can bring-flexibility above all. Austialians were slow to take to the Dauphine, probably becaus in the early days it was much too expensive. Now it offers very good value in its class and sales are reaching a presentable figure. Regie Renault themselves have set up a substantial sales organisation in this country and right now they're busy overhauling their dealer organisation and gaering up for bigger things in the future. Not long ago they took the biggest single step yet in their Australian program -- they modified the Dauphine specially to suit our conditions The move- followed rather poor showing by Dauphines in the round Australia trial. the changes, primarily to suspenion and dust sealing, show that the company is at least prepared to learn. There's no suggestion thiat they are simply trying to offload surplus stock on unsuspecting buyers here. Other improvements are in tyres (which are now four-ply instead of two), seats (more comfortable) gear linkage (more robust with shorter movements) and doors which close with a solid clunk. The Dauphine creates mixed first impressions. I got into it, slammed the door and immediately had to restrain myself from the thought that lightness means flimsiness. In the Dauphine it doesn't. It means rigidity and inteligent stressing - even if the doors do clang. The new seats are excellent. The front ones have flexible back cross-members, so that arch-prone drivers are spared sore vertebrae. A tall driver (I am one) would appreciate quite a lot more rear-ward travel in the runners, even at the expense of rear seat room. After all, how often does the average owner use his back seats anyway? And on a long journey I really could have used an extra inch or two front legroom. Apart from this slight feeling of crampedness. which wouldn't worry a more sensibly-sized individual, I found the driving position quite good. The wheel is well placed. It is also the proper size. Through it peers an arc speedometer with an attractive gold background and Jaeger petrol and water tempera-ture gauges, plus a mileometer and sundry warning lights. The pedals are much too small and too close together. Quite often in traffic I had no idea which one my foot was going to hit. Big wheel arches are to blame here, I guess. 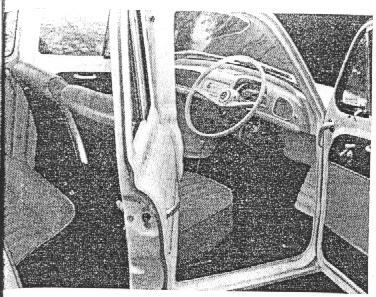 The gearshift is nicely placed right in the middle of the flat floor. Visibility is good across a short, shapely bonnet and the rear vision mirror is well placed (although the one on our test car was faulty). The car is a little beetle-browed, but once again that objection only applies to tall people. 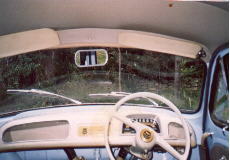 Absorbent crash pro-tection lines the bottom of the dash and on top of the screen. An ingenious stalk arrangement con-trols lights and horn and there's another one for winkers. To start you have to turn an extremely stiff key, which also locks the steering as soon as you pull it out. Memo: never pull that key out on the move! The clutch takes up smoothly and Its movement is short and light. At the first change and ever afterwards you notice that the gearshift has an immense lateral throw between first and second and a very short fore and ait one. I suppose most people would get used to that in time The change has a more solid feel than most rear-engined types and the synchromesh is quite unbeatable. Heel and-toe changes are possible, but a little difficult because of those darned wheel arches. The throttle pedal on our test car had rather a determined initial resistance, which meant that things sometimes happened jerkily. Renault Australia assures me that this isn't so on all Dauphines. They let me drive another just to prove it and sure enough, that had a perfectly progressive pedal movement. Talk of throttle pedals brings me to mention that the Dauphine engine is incredibly responsive. Sudden openings produce instant response, and cut-off is just as pronounced. This applies whether the engine is under load or not. Rear mounted, the 850 cc water cooled engine is silent and smooth. Although the gearbox has only three speeds, the engine is flexable enough to overcome this. Note the additional air filter which intakes the fresh air from in the boot. 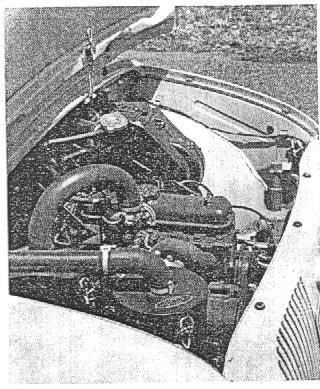 We did have a problem once when the boot was full and a blanket wa put near the intake which managed to choke the engine. It is probably standard on other hot dusty climate models. A lot of people say nasty things about Solex carburettors, but I feel I must hand the Renault's that bouquet. On the road the Dauphine is responsive and light to handle. The rack and pinion steering is well up to standard-precise, shock free and surprisingly quick in spite of its four and a half turns lock to lock. In most normal corners it is almost impos-sible to tell that the car carries its engine in the boot. It goes where you point with no suggestion that the rear end will take charge, or even that the weight distribution is any different from that of more normal transport. The steering has such a strong castor action that a light push on a front road wheel at full lock on gravel will send the wheels back to straight. It may sound ridiculous in view of the paralysis aroused in some buyers by the Dauphine's biggest rear-engined rival, but even an inexperienced driver actually finds himself taking the little Renault faster through corners than he would a conventional car in the same price range. Even during our usual quite abandoned test sessions on the private stretch of level gravel I found it almost impossible to make the car do anything unpredictable. Certainly the last thing it would ever do in normal circumstances is roll. I actually induced it to spin mildly and harmlessly on one occasion (still, of course, in the strict seclusion of the gravel strip) but only by using persuasive techniques and impossible speeds. A habitually fast driver will find that normal mild correction is enough to check any tendency to slide out on fast road corners. Unfortunately the weather man refused to let me try the Dauphine's road-holding in the wet, but experience in the passenger seat of earlier models has shown me that no driver has anything to fear provided he uses his head. The Dauphine is extremely stable right up to top speed. It has no tendency to wander on the straight in normal conditions, although side winds do have some effect on directional stability at cruising speeds. Reason for this is probably a high side area (big overhangs, cigar shape) combined with quite a small tyre contact area, plus the weight bias towards the unsteered wheels. The brakes are annoying. They stop the car efficiently, but they have a vague feel. Almost that stretchy feel that used to emanate from the cable brakes of old. The nasty little pedal I com-plained of earlier is probably partly to blame. The brakes do not fade in normal driving, and even our 10-stop test (10-timed stops from 60 mph with no pauses) produced only mild break down. Recovery was quick. The car stops square. In traffic the Dauphine is particularly useful. It is an ideal car for shopping or for wifely use generally. Because of its low gearing initial acceleration is brisk, although It tails off sharply fur-ther up. Good visibility and an excellent lock make parking easy. All controls are light Boot and Parcels shelf accommodation is reasonable. Fuel consumption is very good. On the road the Dauphine's lightweight and low frontal area allow it to maintain quite high cruising speeds all day in give-and-take country. The car is at a disadvantage on mountain roads because of its three speed gearbox. Second gear means slow work. Rough country tosses most light cars about but the Dauphine now has aereo stable suspension that permits the car to be hammered hard over the worst roads. The suspension is very silent. The steering column transmits little judder. The body has no rattles. Dust sealing is excellent. Rear seat passengers get a good ride. Headroom for them is above average (I hesitate to grumble again, but I did have to bow my head a little just the same) and visibility is excellent Knee-room is adequate but no more. Summing up, the Renault Dauphine is one of the better small cars. Ingenious designers have evolved a car that is quite roomy, very compact, thoroughly efficient and-perhaps above all-fun to drive. It is quite cheap to buy and very cheap to run. It is also good-looking. Strange stories about the Renault's parts position often reach alien ears, but I was assured that the company has done and is doing all in its power to change that.